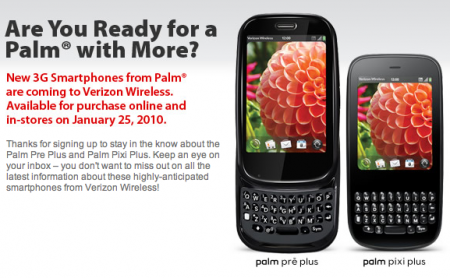 As many-a-reader let us know, the Palm Pre Plus and Palm Pixi Plus are now live and available for purchase at http://www.verizonwireless.com/. Pricing with a 2 year contract: $149.99 w/ $100 mail-in rebate for the Pre Plus, $99 with a $100 mail-in rebate for the Pixi Plus. Don't forget that both should come with a free Pixi if you are thinking you'd like another Verizon line. One thing we haven't mentioned (or knew for sure, technically) are the prices without a contract. That'd be $599 for the Pre Plus and $399 for the Pixi Plus. PC HQ in sunny Florida is lining up late today, we imagine there won't be long lines for what is a relatively quiet launch. Perhaps we're wrong, though - if you have a line, drop us a line at pretips@precentral.net - we'll update this here post with your images.